You are here: Home » What’s the best cooking oil to use? What’s the best cooking oil to use? It’s definitely time to clear up the confusion. In spite of what coconut oil fans say, virgin versus virgin, coconut oil does not beat out olive oil when it comes to smoke point. An oil’s smoke point is that temperature where a heated oil will begin to smoke and degrade. The result can be the production of toxic substances linked to a host of ailments including heart disease, cancer and inflammatory illnesses. Generally speaking the more refined an oil, the higher its smoke point. But when you refine an oil, you also strip it of many of its health-promoting compounds. It’s this area where the myths are rampant. Coconut oil advocates, who trumpet the health benefits of this oil, also favour it for frying due to its high smoke point. But the variety with the high smoke point (450°F) is refined coconut oil. And I have yet to see any studies promoting any health perks for this oil. On the contrary, it’s loaded with saturated fat and its blood cholesterol-boosting ability. Virgin coconut oil, which does seem to offer some health benefits, has a significantly lower smoke point of 350°F. That’s considerably less than the 410°F of extra virgin olive oil– an oil that consistently gets slammed because of a supposed very low smoke point. But there are some drawbacks to using EVOO at high temperatures. As the temperature rises, some of the oil’s health promoting compounds and antioxidants can be lost. It’s simply a waste of a good thing. When I sauté foods with EVOO, I often use just a small amount to cook and then add the remainder when I have finished heating the dish. 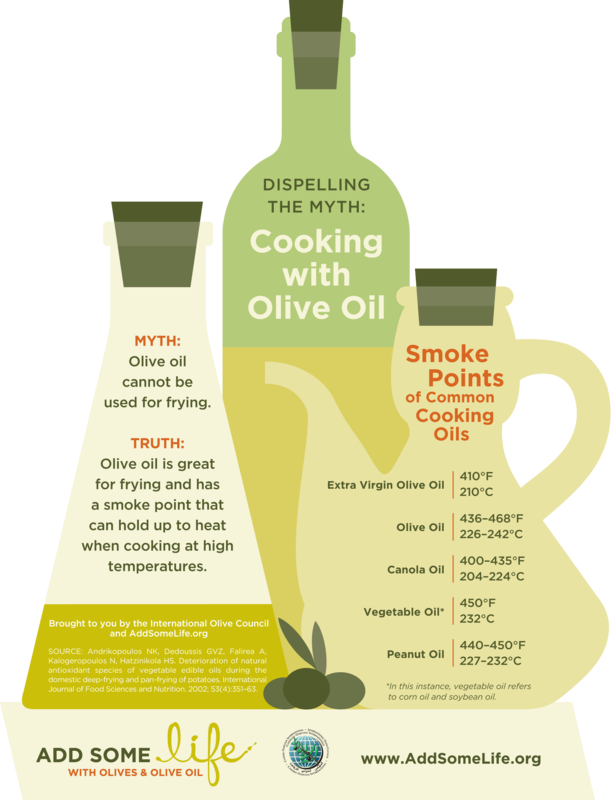 The myth surrounding EVOO’s smoke point was a topic discussed at an Add Some Life event in Toronto, sponsored by the International Olive Council. While hearing presentations on the bounty of health perks provided by olive oil, we were tantalized by an olive-centric dinner which included hors d’oeuvres such as olive oil-poached salmon and an olive bar with an array of different varieties and an heirloom tomato gazpacho topped with an olive oil crème fraiche. The tuna tartar was accented by an amazing creation of Canoe’s chef John Horne, an olive oil powder which burst with flavor as you put it on your tongue. The feast continued with a variety of other local ingredients combined with varying types of EVOO but it was the dessert that was irresistible- a chocolate olive oil ice cream. It was worth every decadent calorie. But back to the myths, the invited guests at the events were all involved in food- writers, chefs and dietitians – and many mistakenly believed that EVOO was not an oil to use for cooking because of its smoke point. Considering all the research on the health perks of using EVOO, ranging from its heart healthy and anti-cancer action to how it boosts the absorption of nutrients from other foods, it makes sense to use it as a cooking oil. As for virgin coconut oil, let’s see some good research from the coconut oil producers to show how it measures up. What’s your cooking oil of choice? Please share in the comment section below. Nice post. I would like to add my thought here. Coconut oil is also one of the best cooking oil but many of the people do not know the benefits of it. It is widely used for cooking in southern part of India. The main advantage of coconut oil is that it is a natural oil and it is cholesterol free and is rich in essential vitamins and fatty acids. Thanks for your comments! There is indeed a great deal of research coming up on the benefits of coconut oil, but I for one, would like to see more before I use it over extra virgin olive oil. Both virgin coconut oil and extra virgin olive oil, like all vegetable oils, are cholesterol free, and contain essential nutrients but one of the reasons (besides all of the research on it) I like the olive better is that it is monounsaturated fat as opposed to coconut oil’s mainly saturated fat. Thank you for your information! I, too, cook mainly with olive oil for the same reasons. What are your thoughts on Grapeseed oil? Grapeseed oil also has a range of health perks but it is made up mainly of omega-6 fatty acids – something we may be consuming in excess. There is a lot of research looking at the current imbalance between omega-3 and omega-6 fats and the toll this imbalance may take on our health. I will be writing some upcoming posts on this topic. Stay tuned!